A kitten was taken in by some nice guys at a tire shop after they found him on the street. It didn’t take long for them to notice just how special this kitty is. The guys from the tire shop were feeding local cats when they found the little 7-month old stray all alone in late December, 2016. The kitten’s eyes caught their attention–they looked like nothing they had ever seen before. Upon close inspection, they realized that he was most likely blind. The tuxedo boy (not a feral in the least) had a very difficult time living among other feral cats that often prevented him from eating and even attacked him. The tire shop owner knew that he didn’t belong there and they had to get him off the streets. Julie Parlett from Southern Counties Rescue received a message about Dudley and knew just the perfect place for him. Knowing that Dudley had to go to a special rescue that knew about blind cats, Julie reached out on Social Media and Milo’s Sanctuary & Special Needs Cat Rescue, a rescue group in Burbank, California, quickly responded. “We aren’t sure how he got there, but we do know he was blind, scared, and dirty. Though the people at the tire shop were feeding him, Dudley was still in danger due to the busy streets around the shop, which was also in coyote country,” Milo’s Sanctuary shares with Love Meow. On New Years Eve the owner of the tire store managed to trap Dudley, and his life was changed forever. 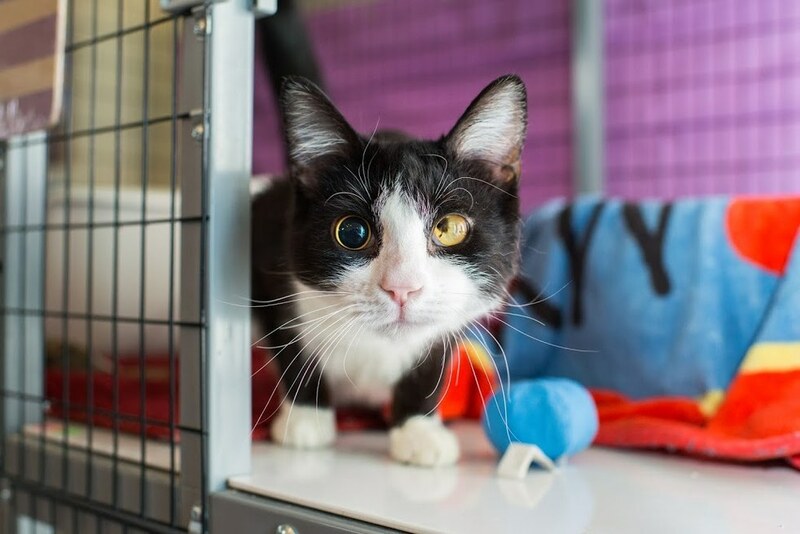 “He was born blind; having one retina detached and the other pupil didn’t form correctly.” The sweet tuxedo was given a full check up, neutered, and microchipped. As soon as he was placed in his Lifetime Care Foster home, he came out of his shell and started to play with toys. The little blind kitty is so happy to be in a safe home that he is playing and running around in pure bliss, loving every second of his new life. Due to his blindness, Dudley has become a permanent resident cat in the Lifetime Care Program at Milo’s Sanctuary where he will get everything he needs for the remainder of his life. No one knows where he came from and how he ended up as a stray, but one thing they know for sure is that Dudley will never return to the outdoors. He now has a forever loving home where he gets to spend time with people he loves and snuggle with other resident cats. He will never be alone any more! This Bug Can Eat Plastic. Can It Clean Up Our Mess?